Saint Patrick Catholic Church, located in Newry, Pennsylvania, sponsors a wide variety of parish activities and ministries. There are Readers, Eucharistic Ministers, Altar Servers, Ushers/Greeters, Adult Choir, and Saint Patrick Guild. Saint Patrick parish has its own outdoor fields surrounding "Justin Hall," a full-size gymnasium with stage. After 200 years, the Newry parish continues to be a vibrant faith community and gives evidence of holding fast to the ideals handed down by those who have gone before them. This portion of Penn's Woods continues to be especially blessed. DEMOGRAPHIC PICTURE: The original parish boundaries that encompassed everything east from Cambria County through Huntingdon and Centre Counties is now served by 31 other parishes. Despite the reduction in territory, the parish still spreads over 40 square miles, embracing the major part of Blair, Freedom and Juniata Townships. It is a part of The Roman Catholic Diocese of Altoona-Johnstown. THE BEGINNING: The Reverend Demetrius A. Gallitzin, the pioneer missionary of the Alleghenies, said Mass in Newry as early as 1789. After Father Gallitzin established his base of operation at Loretto, PA., he attended Newry at regular intervals. Loretto, joined with Bedford and Newry, formed the triangular base for Catholicity in this region. The first settlers of Newry were Patrick Cassidy and Henry McConnell, who migrated from Newry, County Down, Ireland, and laid out the town and called it Newry, after their native place, about the same time Father Gallitzin began his laborious mission at Loretto. It is a matter of public record that Patrick Cassidy in 1801 deeded property for a Catholic Church and for a Lutheran Church in Newry. THE FIRST CHURCH: In 1816, a little stone church was built in Newry and Father Gallitzin dedicated it under the title of Saint Patrick. He continued his personal care of this mission until 1821. Afterward, Father Gallitzin relinquished the eastern portion of his vast mission, including Newry, to his protégé, the Reverend Thomas Heyden, who worked out of Bedford. Bishop Henry Conwell, who came to Philadelphia in 1820, as Bishop of Philadelphia, came to Newry in 1826 for the official visitation and Confirmation. He was accompanied by a young Deacon, John Hughes, the future Archbishop of New York. In 1828, Father John Hughes, served for a brief period as pastor of Bedford with a care for the Newry mission. FIRST RESIDENT PASTOR: Bishop Francis P. Kenrick, the third Bishop of Philadelphia wrote about his first visit to Newry, under the date of October 21, 1830: "A church was built here long ago through the care and generosity of Patrick Cassidy. But the building is very old and hardly fit for divine worship." It was on this 1830 visit that Father Heyden sought permission to build a new church in Newry. He was chagrined when Episcopal approval was denied. The reason for the denial became evident August 7, 1831, when Bishop Kenrick assigned the Reverend John O'Reilly to Newry as the first resident pastor. Bishop Kenrick wrote: "The people of Newry are rejoicing because they are to have a priest, in charge, living in the town." When Father O'Reilly came to live in Newry, he immediately began the construction of the present church. The oldest Newry parish records are dated 1828 and are signed by Father O'Reilly. The first Baptism recorded took place February 28, 1828, Mary Jane, child of Joseph and Eva (Dopp) Nightwine. The total number of Baptisms celebrated by Father O'Reilly stands at 460 (40 of them Adult Converts). He also witnessed 66 Marriages from August 10, 1928 to September 9, 1832. Father O'Reilly was transferred to Pittsburgh before the church building was completed. SECOND RESIDENT PASTOR: The Reverend James Bradley served more than 51 years as Saint Patrick's Pastor. His first task was the completion of the parish church. Bishop Kenrick blessed the church on August 11, 1833. This is the church that is still in use today. There is no doubt that when Father Bradley was in his prime in the 1840's and 50's, he developed a vibrant parish. In 1842 he established a lending library. The library, according to the records, was well patronized. It was while Father Bradley served as pastor of Newry that the parish was included in the newly created Diocese of Pittsburgh, with Michael O'Conner named as its first Ordinary. Bishop O'Conner paid regular visits to Newry, in 1851, 1853, and 1855 for Confirmations. In the History of the Dioceses of Pittsburgh and Allegheny, published in 1880, this account of the Newry parish is given: "When Bishop O'Conner visited the parish in 1847, it numbered, as he states in his notes, about 400 souls. The Congregation has continued for many years, as it will in the future, gradually to increase. The people are mostly Irish, or of Irish parentage. They have grown up around their common father, who has baptized nearly all, and has watched over them and guided them with a father's care; and they, in turn, as it is but right, entertain for him sentiments of filial affection." Father Bradley died April 13, 1883. He is buried in the nearby cemetery with the grave marked by an imposing monument. THIRD RESIDENT PASTOR: The Reverend Richard Browne became the third pastor, serving from 1841 to 1884, when he was transferred to establish a new parish in the fast growing coal town of Lilly, PA.
FOURTH RESIDENT PASTOR: The next pastor of Newry was also the first native born American to serve. He was the Reverend Ferdinand Kittell, born in Ebensburg in 1847. Father Kittell was assigned to Newry in 1884 and he served until 1887. When Father Kittell assumed charge, there was a slight debt. He carried out extensive repairs on the church. All this was paid for and there was a favorable balance of $3.31 in the treasury. Father Kittell was transferred to Hollidaysburg in 1888. FIFTH RESIDENT PASTOR: The Reverend James A. Canevin was Saint Patrick's fifth pastor. He baptized 117 infants and officiated at 20 marriages. He served as pastor until June of 1891, when he was appointed Chaplain of the Sisters of Mercy Academy in Pittsburgh. SIXTH RESIDENT PASTOR: The Reverend Edward Dunphy held the briefest tenure, arriving in Newry in May of 1891 and leaving, after being recalled to his home diocese in Ireland, in March of 1892. SEVENTH RESIDENT PASTOR: The Reverend Thomas Walsh served as pastor from 1892 until his death on January 6, 1898, in his 70th year and the 45th year of his priesthood. THE DIOCESE OF ALTOONA: Between 1880 and 1900, more than twenty new parishes were established in this area, mostly in Cambria and Somerset counties. There was little immediate effect in the vicinity of Newry. However, due to this increase in population, the bishops of Pennsylvania at their meeting in Philadelphia October 1899, proposed a new diocese for this section of the state. This recommendation was sent to Rome. The announcement came from Rome that on May 27, 1901, a new diocese was established with five counties: Bedford, Blair, Cambria, Huntingdon, and Somerset from the Pittsburgh jurisdiction and three: Centre, Clinton, and Fulton, taken from Harrisburg. The cathedral was located in Altoona and the first bishop was Msgr. Eugene A. Garvey, the Vicar General of Scranton, PA. (On October 9, 1957, the title of the diocese was changed to include Johnstown.) Bishop Garvey served nineteen years and became a familiar figure in the Newry parish. EIGHTH RESIDENT PASTOR: The Reverend Robert Waters filled the pastoral post at this point in parish history that witnessed the fading of the 19th century and the formation of a new diocese. His first baptism is recorded October 30, 1897, and his final record dated November 10, 1902. In 1901, the present rectory was built, replacing the original that was more than 80 years old. NINTH RESIDENT PASTOR: The Reverend Michael J. Canole succeeded Father Waters in 1902 and served in this parish until 1907. There were 95 Families carried on the parish roster with a total of 450 Souls. The parish property that included the church, hall and rectory was insured for $6,000.00. His final report to Bishop Garvey placed the parish debt at $245.08. TENTH RESIDENT PASTOR: The Reverend William S. Davies assumed the duties of pastor on March 10, 1907. He might well have been called the last of the equestrian pastors, as he spent considerable time in the saddle visiting scattered families and making sick calls. He built the present tower that provides a covered entrance to the church. He also did work on the church's interior, including the installation of new pews. He likewise supervised the construction of a two-story parish hall to provide a social center for the people. The parishioners were very supportive of his building program. There was no debt when he came and there were none when he left, transferred to Lock Haven, September 25, 1912. ELEVENTH RESIDENT PASTOR: The Reverend Roger S. O"Donnell came to the parish in 1912 and began a twenty-three year tenure that was second only to Father Bradley's. On the occasion of the 100th anniversary of the parish's first church, a three-day celebration in which the four living pastors, Fathers Kittell, Waters, Canole and Davies, all participated. The outdoors shrine of Our Lady of Lourdes was erected by the Hoover Family in memory of their parents, Adam and Mary (McGraw) Hoover. (Later, Father William Rosensteel supervised the rebuilding of the structure.) In 1921 a school with a convent attached was built directly opposite the church and rectory. Eighty-seven students greeted the Sisters of Mercy from Cresson who came to staff the school. This construction left the parish with a modest debt of $11,700.00. Yet, with general economy in shambles, even the interest on the debt became an impossible burden. By 1934, the parish debt had increased to $22,500.00 and the number of parishioners had fallen below 600. In 1935, Father O'Donnell was transferred to Our Lady of Lourdes, Altoona. TWELFTH AND THIRTEENTH RESIDENT PASTORS: The Reverend James Hickey followed in 1935, but, because he was in poor health he served only two years. He was succeeded by the Reverend Jeremiah P. Flynn, who filled the post for twenty years. A fire, in 1944 destroyed the frame school and convent. Father Flynn was able to communicate to the parishioners, who responded, to the rebuilding of the school, convent and hall that still remains today as a monument to their dedicated endeavors. It was ready for dedication by the Most Rev. Bishop Richard T. Guilfoyle, the third Bishop of Altoona, on January 21, 1945. Father Flynn remained in Newry until his reassignment in 1957. FOURTEENTH RESIDENT PASTOR: The Reverend Raymond E. Cupples came to Newry in 1957 and he filled this post until his death, January 4, 1972. It was during this time that the strictly rural character of the parish area began to change. It slowly assumed a suburban atmosphere with housing developments offering countryside amenities to commuters willing to drive increasing distance to work. 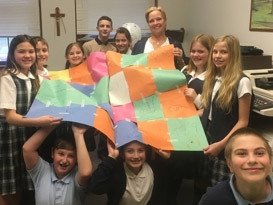 Two parishes emerged from Saint Patrick's: Saint Catherine of Siena in Duncansville, in 1963 and Saint Thomas More in Roaring Spring in 1969. FIFTEENTH RESIDENT PASTOR: The Reverend Julian K. Benson became the pastor in June of 1972 and he directed the affairs of the parish until his death, sixteen years later in 1988. Within a year of his arrival, a fire broke out on the second floor of the rectory which was brought under control quickly. But, the damage ran between three and four thousand dollars. SIXTEENTH RESIDENT PASTOR: The Reverend William A. Rosensteel received the Newry assignment in 1988. During this time construction of a gymnasium was completed along with an enlargement of the parish school. This task was accomplished with the aid of the parish bingo, numerous fundraisers, the parish festival and gifts and bequest. Father Rosensteel remained until his reassignment to Holy Rosary Parish in 2002. SEVENTEENTH RESIDENT PASTOR: The Reverend Msgr. Anthony B. Little was assigned to the parish, July 2002. SISTERS OF MERCY: Across the decades the Sisters of Mercy have been a powerful force in the Newry parish life. They came through here in 1843 from the Carlow convent in Ireland, under the leadership of Mother Francis Xavier Warde. Across the years, ten young women from the parish dedicated their lives to the service of the Church by joining the Sisters of Mercy. They are: Sisters Jane Frances Hite, Rosemary Hite, Benedict Heiss, Alban Nale, Honora Gonsman, Aileen Flynn, Charlene Kelly, Jane Kelly, Ruth Neely, and Veronica Kovach.